Planning a retreat requires organization, and that’s something I’m not always the best at. Even as a child, I ‘organized’ by making stacks and piling things in my closet so that my room looked better. Sometimes, I could get that past my mom, but most of the time she saw right through me. Retreat planning can feel overwhelming anyway with all there is to do. If you don’t stay organized along the way, stress piles up even further and can keep you away from remembering the true reason for the event – bringing women together to share Christ. I want to share with you a few of my organizing tips that have helped me keep my sanity and allow my team to focus on our true purpose. From financial organization to supply organization, I’m going to give you all the things that have helped me. For your Team – When you’re bringing a team together to distribute responsibilities, you need a good program to keep both your teams and tasks organized. Trello, a free online collaboration tool, is perfect for this. Sign up free and create a retreat planning board where you can put together your teams and tasks. Set due dates and keep track of everything in one place. You can even share your boards with your teams to make collaboration easier. For Registrations – Keep track of registrations and registrants information by using Google Forms. Google Forms are free and simple to create and collect data. Make your own or use my customizable Registration Forms. You can read more about them here. For Finances – You’ll want a way to keep track of incoming retreat fees and outgoing expenses. I used to use Microsoft Excel but have switched to Google Sheets. Like Forms, Sheets is also free and pretty simple to use. Create your own or use my template – Budget/Expense spreadsheet – sign in using your Google account, click Make a Copy, customize as needed. Be sure not to change the cells with the formulas. That will mess up your totals. For Supplies – You’ll end up having so many supplies, you’ll need a way to organize and carry them all. We used clear plastic storage totes to hold items for each breakout session, our keynote sessions, and our crafts. We also used these small containers to hold colored markers, polymer clay, glue sticks, and other small items we needed to keep track of. For Paperwork – I used colorful pocket folders to distribute retreat paperwork to all retreat-goers. I also used these three ring binders with dividers for my teams so that we could keep track of planned music, food, speaking sessions, and games. It’s great to have it all online, but sometimes you just need to hold a hard copy too. I learned that the hard way after the first retreat. When I was out and about checking on sessions and making sure everything was running smoothly, I needed to have some of that information with me. I could access it on my phone, but I really like the big binder over the tiny screen. For Scheduling Kitchen Help and/or Breakout Sessions – We used a Post-it Super Sticky Easel Pad that just stuck right to the wall for organizing tasks for the kitchen and for our breakout sessions. For kitchen help, we title the tops of the Post-Its with each meal. Then, we label an area for meal prep and for clean-up and then number each area. The ladies sign up next to the meal and area they want to help with. This way we can see at a glance whether our cook has enough help. We also use these for our breakout sessions. We put the name of the breakout session at the top and then number from 1-12 (or however many spots are available in the session). This allows us and the ladies to see when a breakout session is full. 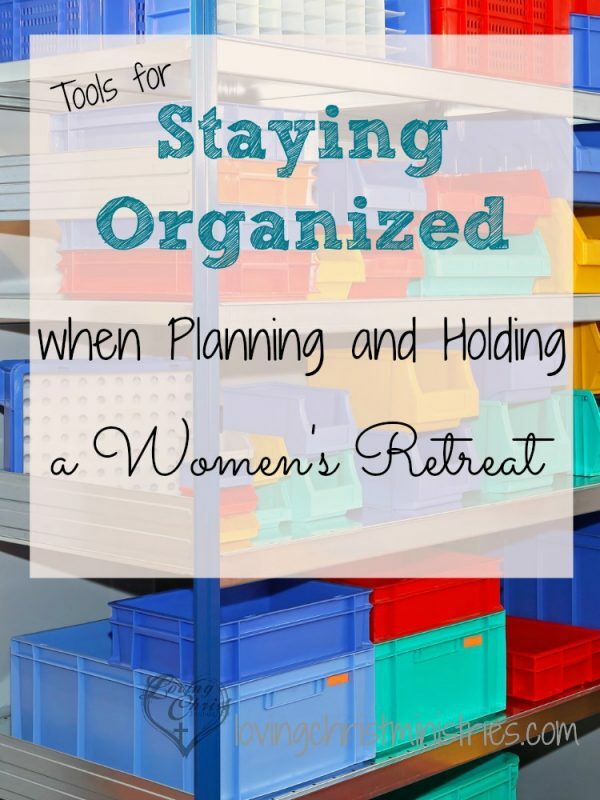 I’d love to hear any of your ideas for staying organized at your retreats. Email or comment below.